Bloglovin, DMC Mentor, and Craftsy. OH MY! I’m trying to get a little more into this. There is more options for crafter/bloggers than I had anticipated. One of which is Bloglovin. I’ll have to add an icon to the right when Jeff has a minute. I attempted it myself, but honestly, why? My husband codes. Duh. Bloglovin seems to be the thing that I’ve been looking for. You can’t search blogspot, which is annoying. Pinterest can only take you so far and Facebook, well Facebook is not the place and I’m sick of staring at it waiting for something to happen. Bloglovin allows you to follow blogs that you like and even notifies you when there is an update to a blog you follow. God knows I don’t need to be on the computer more than I already am. Hopefully this will help to make my time a little more efficient. If this is a service you already use, please, feel free to follow me here. If not, check it out, there are a ton of different categories. 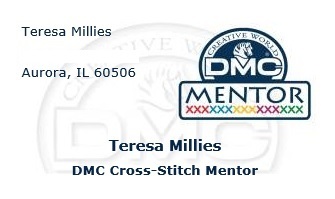 One of the other things I did recently was sign up to become a DMC Mentor. They accepted me! This means that I am qualified to do small classes of cross stitch and embroidery. They will send me kits and give some information and tips for of instructors/mentors. This is absolutely something that I would want to get into. They are sending me a starter kit and I’ll post about the goodies when they get here. If you want to learn to cross stitch, embroider or crochet, let me know. I’m qualified. I even got a business card! They really are a great spot for fiber arts and especially sewing. I’m going to use the credit they give me for a class for a sewing class. Onward Operation: Learn All The Crafts! This entry was posted in cross stitch. ← Just a little Sprinkle to show we care.